Nike toasted the fourth anniversary of “Flyknit” with an infographic about its mold-breaking technology. What’s the big deal? Unlike conventional shoemaking techniques, Flyknit allows designers to “micro-engineer” every stitch to create a formfitting, lightweight, pliable, and nearly seamless upper while reducing both the materials used and the waste leaves behind. The debut Flyknit Racer, which made an appearance in February 2012, was the apotheosis of years of research and development. The result, a shoe that fit like a sock but had the support of a trainer, was revolutionary for its time. 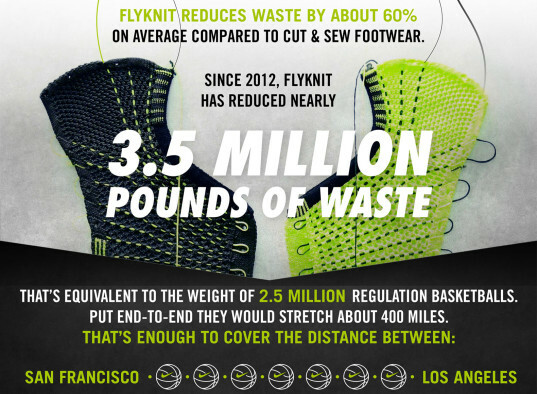 Because Flyknit reduces waste by about 60 percent compared with traditional cut-and-sew footwear, the sportswear giant claims it has saved nearly 3.5 million pounds of waste—equivalent to the weight of 2.5 million basketballs–since the technology was introduced. As of 2016, Nike has completed its transition of core Flyknit yarn to recycled polyester. So far this has diverted 182 million plastic bottles from the landfill—or enough to cover more than 300 full-size soccer pitches, according to the company. Other fun facts we gleaned: Nike owns more than 500 Flyknit-related patents for technology and design. In fall 2015 alone, the company boasted 28 Flyknit models in six categories, including running, basketball, football, and soccer. “Nike Flyknit is truly a minimalist design with maximum return,” a spokesperson said. 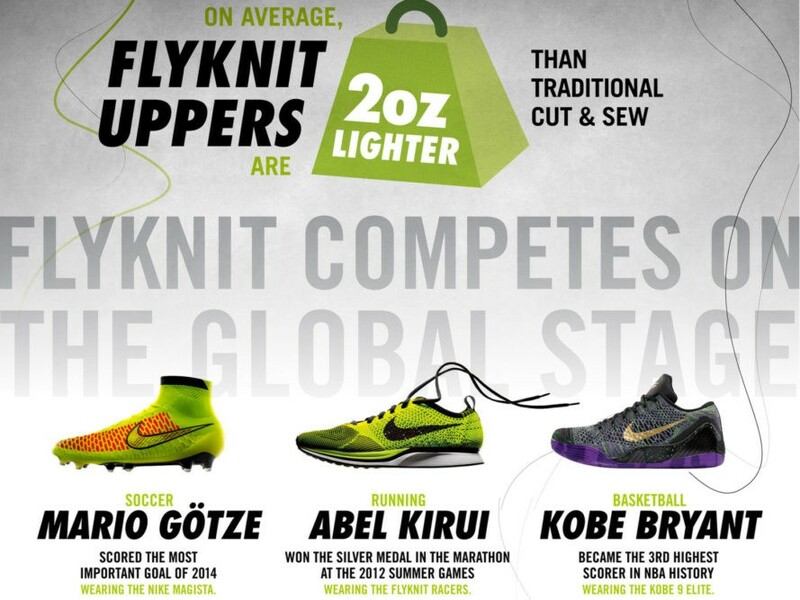 Nike toasted the fourth anniversary of "Flyknit" with an infographic about its mold-breaking technology. What's the big deal? Unlike conventional shoemaking techniques, Flyknit allows designers to "micro-engineer" every stitch to create a formfitting, lightweight, pliable, and nearly seamless upper while reducing both the materials used and the waste leaves behind. The debut Flyknit Racer, which made an appearance in February 2012, was the apotheosis of years of research and development. The result, a shoe that fit like a sock but had the support of a trainer, was revolutionary for its time.